When it comes to detective and crime literature we forget how much those genres dominated the magazine stands and news racks during the first half of the 20th century. We also seem to forget how important pulps were to the reading public during that period. Named for the low quality paper product they were printed on, the truth is that pulps thrilled millions of readers during a time when the entire population of America numbered around 120 million. These wild and fantastic magazines were easily available. It is believed that for every pulp purchased, it was passed on to an average of five other readers. That means an incredible number of people were spending time with these forgotten classics. Titles covered genres such as fantasy, science fiction, romance, and most importantly crime. Some of the pulp writers—such as Dashiell Hammett, Robert E. Howard, and Raymond Chandler—achieved literary immortality for what they wrote. In all honesty others who wrote for the genre simply pumped out stories and collected paychecks. But near the top of the field, there are also some very strong and highly individualistic authors ripe for discovery today. Bring ’em Back Dead gives us a chance to find a forgotten writer who deserves our attention: George Fielding Eliot. Featuring work he first published in 1935, the three stories found in this anthology not only give us a thrill a minute action ride, they reveal a master craftsman, one who wrote with a fever and from experience. There is knowledge of his subject many other writers of the time lacked. Mr. Eliot was no novice. He had written many military themed stories for other publications and also published nonfiction military articles. He had served in the Australian Army and he was a retired Major from U.S. Intelligence. Moving his experience from the military into something as new as the FBI was proved to be a masterstroke for him. When these stories first saw light in 1935, America’s appetite for tales about crime and criminals was nearly insatiable. Prohibition had ended two years earlier, and the nation was transfixed by organized crime. Publishers were eager to appear to be on the side of right, to be in line with what Hoover was building with the FBI, or G-Men (Government Men) as they were called at the time. The concept of a nationwide police force was something brand new to the American people and the public needed to be convinced of its need. Mr. Eliot was the perfect writer to remind readers exactly why a force such as the FBI was important to this country. Like the hero, he wrote in a style that is crisp, direct, and authoritative. What Mr. Eliot wrote helped add weight to Hoover’s drive to rid the country of such abhorrent activities as kidnapping, extortion, and robbery. Reading theses stories today you can’t help but marvel at the violence, the pace, and the matter-of-fact delivery of even the most horrific description of the action. Not a magazine store, not a supermarket, but a toy store! The obvious inference being that your child could have been standing in there at the time. In two swift sentences Mr. Eliot makes the crime very personal and the reader doesn’t even realize that Mr. Eliot has so subtly manipulated them. Mr. Eliot takes the violence Hammett had written in his 1929 novel Red Harvest and takes it one step further. Only Eliot surrounds the action with the firm moral conviction of United States law. There is no ambiguity; no qualities of the “anti-hero” are present in Dan Fowler. Not only do these stories each reflect the concerns of the time, they also tell us more about our country than a dry history textbook ever could. What Eliot writes about in each of these stories mirrors what was written in headlines across the country. Publishers eager for new readers had no qualms about exploiting these headlines in order to grab readers. If the stories told in pulps such as G-Man—where these three novellas first appeared—happened to be as violent as the headlines, so be it. Magazines such as these were in the pockets of workers, soldiers, and kids from Maine to San Francisco. In his introduction, novelist Matt Hilton talks about discovering Dan Fowler stories for the first time. His excitement at finding a writer like Eliot is palpable. Hilton also places the stories in a clear context of the times as well as establishing a clear link between what Mr. Eliot is writing in this series and evolution of the action hero across the decades to come. By the seventies millions are thrilling to the exploits of Remo Williams, Mack Bolan, and Nick Carter. Today many are finding just as much adventure in his series of Joe Hunter stories. There will always be readers for a good adventure story; what George Fielding Eliot wrote in the Dan Fowler collection is among the earliest and the best. 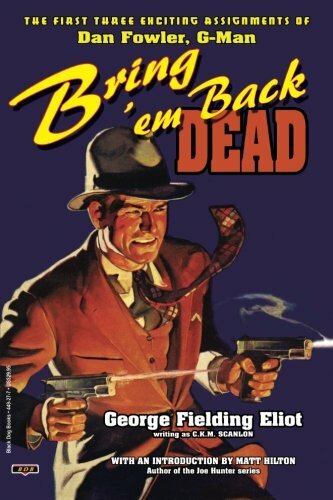 Bring ’em Back Dead is the perfect introduction to both a forgotten hero and a great writer.